Robots are invaluable tools in the workplace, but they often still require a specialist to train in anything more than elementary tasks. 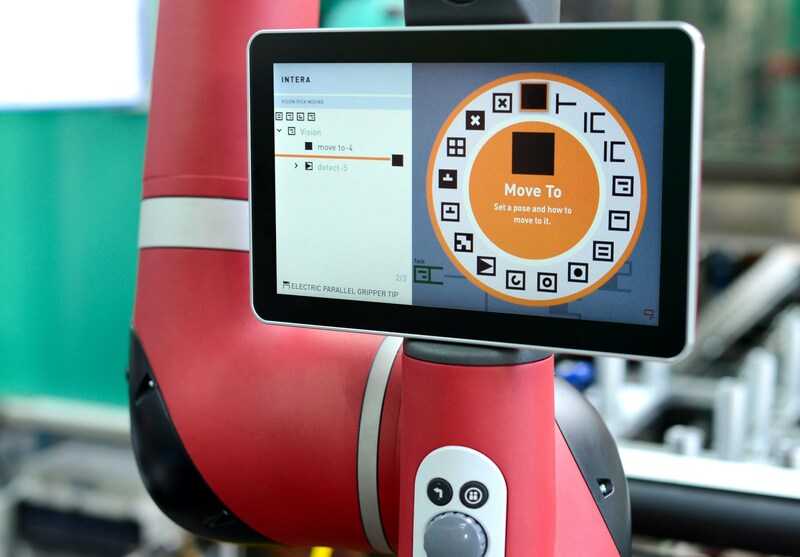 Rethink Robotics is helping improve that situation with a powerful and intuitive new platform for its Sawyer robots called Intera 5. Many robots already allow anyone to “train” them by, say, moving the arm along the path it should take and programming actions at the end. But building more complex behaviors can be tricky. What if you want a robot to grab a part and put it in place, but if it sees a red error light come on, to pull it out again, replace the part with a new one and put the faulty one in a box five feet away, then note the serial number of the PCB for the record? Or, if it runs out of parts, or if nothing comes down the conveyor belt, to do this or that in response? These cascading choices multiply quickly and few robot systems are equipped to have new ones put in on a regular basis — or if they are, it’s dedicated roboticists or coders who do it. This limits the ability of, say, a small factory to switch between jobs or reconfigure if demand increases. Intera 5 is a way for on-the-floor workers to change or add behaviors easily, with hardly any training — let alone an engineering degree. It’s a relatively simple behavior tree system with a bright, straightforward GUI and instructions. If this, then that: scan, move, pick up, put down, softly, quickly. And because the robot uses computer vision, you don’t have to make sure every part or bucket is where it needs to be with millimeter precision. It also can be programmed from the desktop with a similarly visual UI. Being able to automate easily and respond quickly to changes in the workflow or new orders makes a robot a much more attractive prospect for small businesses that might have gotten by until now with temps and minimal automation. Existing Sawyer robots should be able to get the Intera 5 update soon, and new robots will have it installed by default.